The TVP VTU Koncept is a Czechoslovakian tier 8 medium tank. A medium tank project, proposed by the Škoda company as part of the general purpose vehicle concept developed in Czechoslovakia. No prototypes were manufactured. The TVP VTU Koncept leads to the Škoda T 50. Can mount the top gun without researching the top turret. The TVP VTU does not only look like the Škoda T 40 premium, it feels the same way. It is a fast tank with a high profile. You get to chose either a 8.8 cm gun with high DPM or a 10.5 cm with a higher alpha. The 8.8 cm gun is superior in every respect except for Alpha damage. The guns fire low velocity shells and therefore making it hard to fire at long range. In order to hit the target with more consistency, you should avoid firing before the reticle is fully aimed. The TVP VTU has everything it needs to be a good tank except one crucial thing : the ability to survive a hit. The tank has a very thin armor, which wouldn't be such an issue if the modules weren't so fragile. While driving this tank, you can expect a module to break or a crew injury on every hit. Since the tank is very tall and boxy, it is also very hard to hide in cover. While driving this tank, you should stay as far as you can from the front line, but close enough so that your gun firing arc doesn't become too much of an issue. 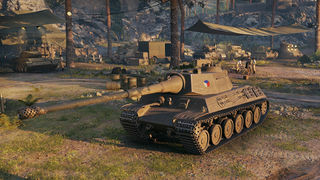 The Czech tier VIII grind is very painful, but the IX and X are definitely worth it. Free XP the suspension, 88 gun, turret, and engines, or expect to be merely a spectator for many many games as despite your best efforts you will earn minimal xp to unlock these modules. The 100mm gun and top radio are both researched and used on the tier 7 T-34/100. Mount them right away. Suspension comes first. It gives more load capacity for new modules and better mobility (especially hull traverse). Alternatively, mount Enhanced torsion bars. 8.8cm gun comes next, since it is much better than the 100mm. Engines give more hp/ton, but since the tank has a decent 18hp/ton stock, the engines can be saved for last. 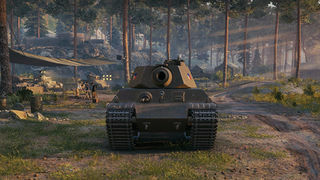 The top 100 mm gun is inferior to the 88 mm and does not carry over to the Škoda T50, so it can be ignored completely. The stock turret has better gun depression than the upgrade. Vertical Stabilizer and Gun Rammer are a must. Coated optics for aggressive playstyle, Binocular Telescope for passive playstyle. Crew skills should focus on enhanced mobility, as well as view range and accuracy for long range fighting. Save-stowage on the loader is mandatory. 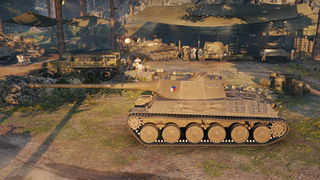 This tank, like many Czech tanks, tends to take ammo rack damage every time it is hit. 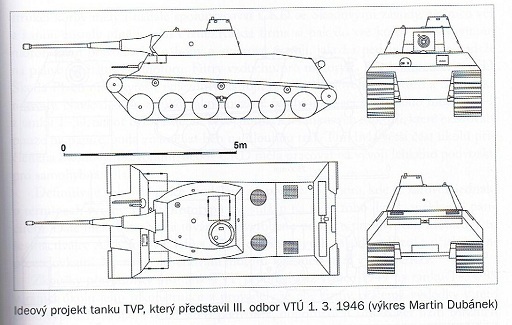 The development of post-war Czechoslovak tanks started very soon – by the end of 1945, where VTÚ (Vojenský Technický Ústav – Military Technical Institute) filed a report to MNO (Ministry of National Defense) and to the local Red Army committee on the state of current tanks and other armored vehicles development. This led to series of proposals I will deal with later, culminating with the TVP project (Tank Všeobecného Použití – Tank for General Use). TVP was heavily influenced by both Soviet (cast turret) and German development (gun mount, welded turret version, mantlet) and drew from the best of both worlds. Interesting fact is that the vehicle design itself was to be selected only after selecting the gun itself (the tank was supposed to be “built around the gun”), based on comparison trials of all the guns available. In December 1945 to February 1946 (Dubánek here mixes the dates, an obvious typo – I fixed it), the VTU representatives considered the 88mm German AA gun (the AA role is specifically mentioned, but it’s possible the author has the KwK 43 L/71 in mind – in post-war Czechoslovakia, the PaK 43 and 41/43 were adopted due to the lack of native or Soviet AT guns as PTK vz.43 (protitankový kanon – AT gun, vz.43 – 1943 pattern) with shell velocity of 1000 m/s or a 105mm gun (900 m/s) to be viable, as during tests, both were able to penetrate 100mm of armor at 3000 meters (60 deg – means 30 deg using German angle methodology, at that point Czechoslovak army was using the German trial methods, unlike the pre-war ones, that were very obscure). It was a classic Czechoslovak tank school concept. The hull shape resembled the one of LT-38 and it still had leaf springs. The mantlet shape was influenced by German tanks, the driver and radioman hatches were actually inspired by British designs. The Soviet inspiration was in the electrical propulsion of the turret rotator. This first version also had a hull flamethrower, linked to the bow machinegun (Vz.37 or BESA). It was considered to implement an automatic loading mechanism by Škoda (37mm, 47mm and 57mm versions existed), but at that point it was decided semi-automatic breech would be sufficient. The coaxial machinegun was to be linked to the gun within the gun mount in order to save space in the turret. Commander’s copula was recommended to be made fully traversable with 5 episcopes attached to the traversing ceiling, along with commander’s binoculars or artillery binocular sights and was to be equipped with holes for emeregency signal flags. The turret was also proposed to be equipped with a roof-mounted grenade launcher/mortar for close defense (5-20 meters). The bow machinegun (and the flamer) were capable of -10 to +25 elevation thanks to the mount, similiar to the LT-38 tank. The flamethrower was to be fuelled by a 100 liter napalm tank (not technically napalm, Czechoslovaks developed their own flamethrower fuel of excellent properties, might get into that if necessery) – this tank would prolong the hull only by cca 25 cm. The vehicle was to be equipped with a smoking device and by additional side armor (“Schurzen style” – another German lesson) consisting of steel mesh, fixed at 20 cm from the main hull. This mesh armor was trialed as early as 1945. The mobility was to be ensured by an unspecified diesel air-cooled engine, providing the vehicle with power-to-weight ratio of 20 horsepower/ton (interestingly, the ratio was specified, not engine type or horsepower, given the fact the tank was proposed to weight 33 tons, the engine would have to have 660 horsepower). Ground pressure was not to exceed 0,5 kg/cm3. The design counted on leaf springs for suspension, which was clearly a weakness the designers realized. The commander of VTU, Col. Ing. Josef Trejbal proposed at least two prototypes to be built by each of the design competitiors (realistically, only Škoda and Praga were available). Each of the prototypes was to be built without the gun first. Škoda reacted on these VTU demands first with its proposal from 8.12.1946 (archive drawing designation Am 39-P), which was considered to be the “factory” version of the theoretical VTU TVP design. Between 1947 and 1948, the conditions of the project were being “chiseled”, including the final version of army demands (that were always in the flux). There is very little known about the TVP project from this era. 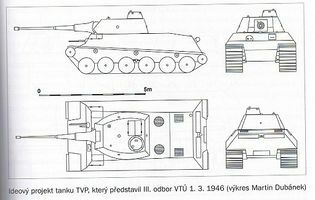 Czech historian Oto Holub (Československé tanky a tankisté, 1980) claims that in 1948, Škoda was working on a “medium TVP tank” weighing 16 tons with a 75mm gun, powered by a Škoda 147,2kW (197hp) engine with Praga Wilson transmission and 3-man crew, but it is widely believed (Dubánek et. al.) 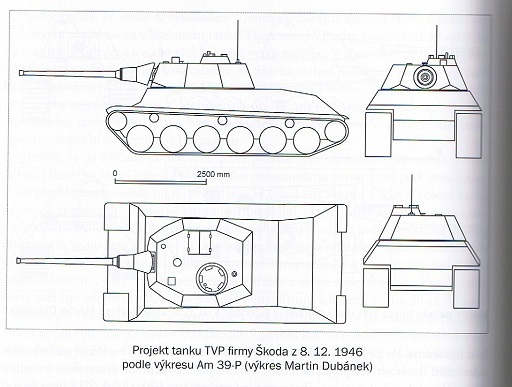 that Holub simply mixed up the Škoda T-17 light tank project with TVP. Holub also mentions a “heavy” version of TVP tank (which most likely would be the TVP we are talking about) of following parameters: 30 tons, 75mm frontal armor (40mm sides), armed with a (German) 105mm gun (900 m/s), powered by an unspecified Škoda 454 kW engine (609 hp), Praga Wilson transmission and 50km/h maximum speed. As for the guns used for this early project, two are mentioned. First is the 105mm gun (apparently of German origin) with 900 m/s velocity, which would correspond to the German 105mm FlaK 38/39 (881 m/s) of which 200 or so were made and some where most certainly left on Czech territory after the war was over. The Czechoslovak army officially adopted the type into service after the war with the designation of 105 mm PLK vz.39N (PLK = Protiletadlový Kanon, AA gun – vz.39 = vzor 1939, 1939 pattern and N = německý, “German”), on 1.2.1949 the army had 24 of them in service, on 1.4.1960, 16 were still in service officially. "Further research into this type of shell is possible." The penetration at 1000 meters is the only real data we have on its penetration. 90mm at 60 degrees (almost certain to be 60 degrees, as Czechoslovak army used German methodology during the war) means cca 104mm at 90 degrees. Based on PaK 40 L/48 and PaK 42 L/70 examples, the loss of penetration between 100m and 1000m is roughly 20 percent, which would give us solid penetration of 130mm at 100m. The capacity of the autoloading mechanism is however not known to any of the Czech sources. Given the fact that proposed tier 6 T-25 would use this gun too, it gives us a nice continuation possibility. If needed, three more guns could be considered. All three were paper designs from 18.3.1947 – these three Škoda proposals were: 76,2mm L/49 (6,58kg shell, 840 m/s), 76,2mm L/66,5 (6,58kg shell, 1000 m/s) and 88mm L/66 (10,2kg shell, 1000 m/s). The 88mm project was scrapped on 10.6.1947 (76,2mm caliber was decided to be sufficient) and the development of the other two led to the development of the A19 AT gun (76,2mm L/70, 6,4kg Soviet AP shell in a longer casing, 915 m/s velocity). The A19 gun was subsequently improved to L/72, muzzle velocity was increased to 925 m/s, Dubánek mentions the use of a (Soviet) 76,2mm subcaliber shell. A prototype was made (firing trials were successful) and the development continued until 1951, when the gun was rebored to 85mm (or, rather, Vz.44S (S-53) 85mm gun barrel was used), resulting in the creation of 85mm Vz. 52 cannon, but that’s already irrelevant. The original A19 prototype exists physically in Lešany tank museum. By 1948, (now nationalized) Škoda was ordered to actually deal with the project, since the chassis was proposed to be used for several SPG and TD project (this was ordered by the DKS (artillery committee – a panel of ministry of defense and Škoda artillery experts) on a meeting, held from 18.11.1948 to 20.11.1948. The initial TVP idea, developed in 1946. The in-game TVP VTU Koncept uses the hull from this design, as well as its stock turret. The T-50 Škoda model, developed in late 1946. The in-game TVP VTU Koncept uses the turret from this design. This page was last modified on 23 August 2018, at 16:11. This page has been accessed 61,253 times.